In the inaugural season of OGT Clans, we welcome 10 teams, 60 players in total, to explore and experiment with what we think will only further deepen the immersion of the OnlineGolfTour. The OGT Clans will ultimately be like your normal men’s league night but, as we always do, with an OnlineGolfTour twist. The inaugural season of clans will last for 96 weeks allowing for 4 week of playoffs. The 96 regular season weeks will be comprised and rotate between 3 game modes (Scramble, Best Ball, and Alt Shot) and will all be 2 man tournaments. Every week clan captains may choose to assemble new teams or continue with the previous week’s teams. We will use a football type league with two divisions. 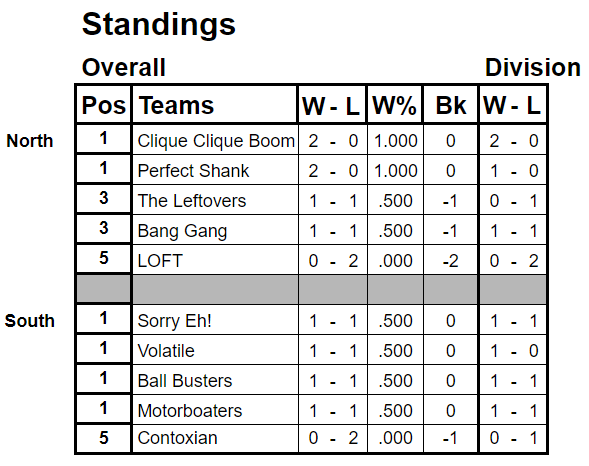 It will be a wins/losses standings. For a 16 week schedule, Each clan will play divisional opponents twice while playing clans in other division once or twice. Playoff will follow the regular schedule. Scrambles will be handicapped 50% of the lowest cap player on the team. Best Ball will use 50% of lowest cap + 50% of highest cap. Alt Shot will be 50% of the highest handicap. Good luck to all and enjoy OnlineGolfTour Clans! The match-ups for 2019 Clan League are below. 16 weeks of regular season play followed by playoffs. Regular season runs from 4/1 to 7/21. Below is the schedule for the first half of the Clan League season. I plan to follow the action and make subtle changes if necessary to ensure a fun, but challenging experience for all. Some of the events will be fairly easy, while others will be a little more challenging, but should be exciting nonetheless.